We had been aware of this Solar Eclipse for years, and had talked about going to see it. In the Summer of 2016 I was lamenting that it was probably too late to make preparations and we would no longer go. Agnes said "why not". I realized she was right, so we started preparations. Originally, I wanted to go to the closest place to us, which would be South Carolina, but Stephanie said she wanted to do something different. We had never seen the state of Oregon, so she wanted to go there. We started preps by mapping out sights to see and figuring out where to stay. I knew we would circle the state, and end the trip at the Eclipse. This way we would be most familiar with the state, and could best move to a new site at the last minute if weather did not cooperate. The plan was to circle the state in a clockwise fashion. (aka Mr. Eclipse) at the NASA Goddard Space Flight Center on 1/18/2017. In Jan 2017, we went to see a talk by "Mr Eclipse" at the Goddard Space Flight Center (Building 8 auditorium), and it made us realize that the best climate along the entire path would be east of Mt Jefferson in the desert area of Oregon. 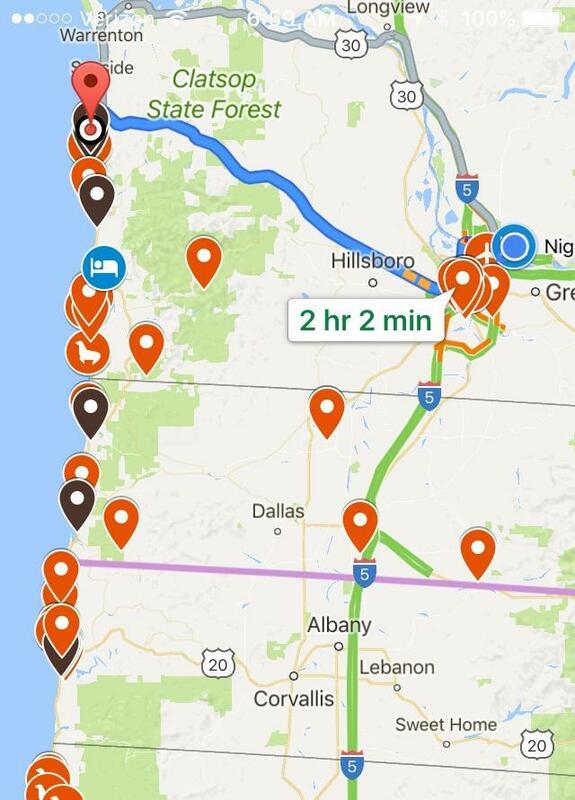 At that point, we decided to circle the state in a counterclockwise fashion, and start with the sights along the Pacific coast. The number one take away for us from the talk by Fred Espenak was this chart showing that the best climate along the path was in the basin east of Mt. Jefferson. I put together a Google Map with the sights we wanted to see and started to book places on Hotels.com. The places to stay were marked with blue markers, and destinations in red markers. I also marked the path of totality for reference. We quickly filled the map with more places we could possibly visit and the plan was to decide on a daily basis and based on proximity which places to go to. In hindsight, this plan worked extremely well. We also decided we would see the actual eclipse in Madras, OR. By February 2017, we had all the rooms booked except for Eclipse-eve. As for plane tickets, Southwest, my preferred airline, had not opened up bookings for August yet, but I knew that they would around six months out, or in March. I jumped on the site as soon as the bookings opened up and was surprised to see basically every flight was wide open. 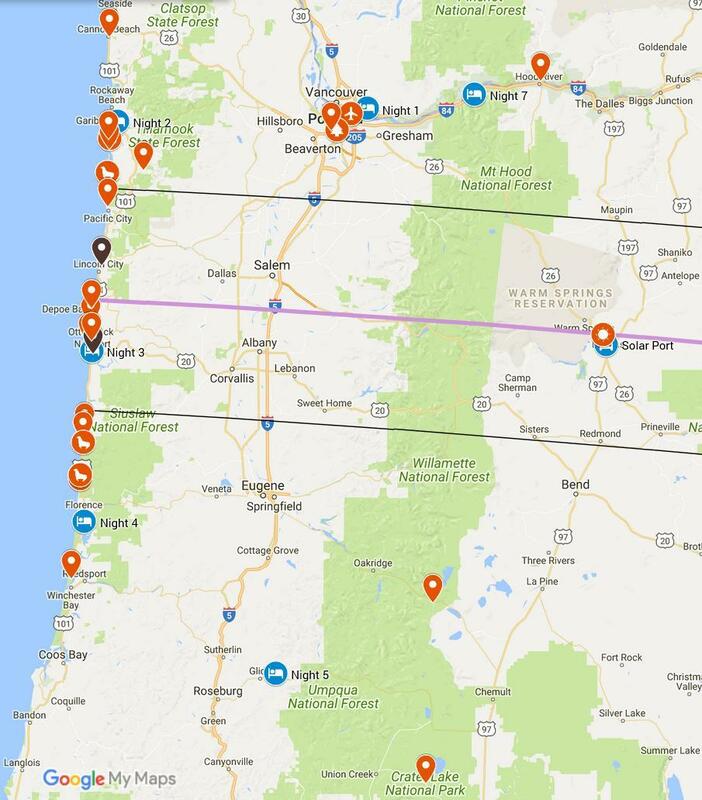 I booked to fly to Portland on 8/15, stay one week and leave the day after the eclipse on 8/22/17. As the eclipse day approached, I made a posting on Facebook to show how to build a binocular solar projector. My main concern was the people in Aruba that may not have access to certified solar eclipse glasses. The posting was well received and I was later requested to shoot a how-to video. from Space and Nature Aruba, I would later make a how-to video. The last lodging reservation to make was the night before the eclipse. As far ahead as 8 months, there was absolutely no lodging available in the area of the path of totality. We finally settled on a place in Vida, Oregon. It was a beautiful cabin with a stream behind it and the pictures looked amazing. The one problem is that it would be a 2-3 hour drive from there to Madras along narrow mountain road. We were starting to see doom and gloom scenarios for the traffic, and I dreaded the scenario where we would be gridlocked on the road and the zone of totality still ahead of us. Not making that zone would ruin the trip in my eyes, so we decided the best plan was to leave the Vida cabin at 4am. Gradually, this plan evolved to staying the night in Madras in our rental car at the local Safeway as that would allow us to access bathroom facilities. It remained an unsolved problem for a long time. A week before the trip was to start, out of worry about the logistics of eclipse day, I googled the term "Madras OR eclipse traffic" and found the site for the city of Madras for this event. On there was a link for how to pay for a parking spot at a campsite (with porta-potties) for only $25. I jumped on that opportunity and we also later sprung for a camping site for an additional $50. We cancelled the cabin at Vida, and were finally happy with the plan for the arrival at Madras. Final map of our trip. Blue markers are lodging points and red are sights. We started in Portland at the top and worked our way counter-clockwise around the map. The path of totality is the purple line, and the northern and southern edge of totality are the black lines. We arrived in Oregon at Portland PDX airport, and spent the first day exploring the city of Oregon. We settled on seeing the Japanese Garden and the Rose Test Garden. Our first stop in Oregon. The entrance stairs to the Garden. The gift shop on the right and the bistro is on the left. The Garden was designed by a University Professor and is really beautiful. touch to the garden's views. This is at the exit of the garden. on it when exiting the Japanese Garden. We were glad to see it however. After a day like that, Japanese food seemed the best fit. Day 2. Start of exploring the coast. Our first night in Portland was at well appointed Marriott Residence Inn (with my points). After this, we would be staying at small non-chain places. The first morning in Oregon gives us a beautiful sunrise. The local paper on the first morning of our stay in Oregon. You get the sense the state is ready. Our intended drive path for the first destination: Cannon Beach. Off we go on our adventure! I had pre-paid for an SUV, but upgraded to a mini-van at the pickup point at PDX. It was one of the best decisions I made. Heading West we stumbled on a restaurant called "Camp 18". We were attracted by the numerous flowers and antique machines around the property. This behemoth is a building-sized band saw. It is huge and great to see the mechanisms. A water wheel that used to produce power in a river. We found some ripe, wild black berries on the property. They were sweet. Our first stop and northern most point along the Pacific coast was Cannon Beach. The sight is dominated by this huge monolith. It is really impressive to arrive and expect a flat beach and be surprised to see this massive mountain of a rock sitting on the beach. One of the things Stephanie wanted to see was tidal pools. this starfish with a hermit crab stuck to it. We also visited the town of Cannon Beach, and it would be the prettiest town we would see on this trip. It was a beautiful day, and we saw some nice shops and restaurants. We also saw a taffy wrapping machine that was very interesting. From Cannon Beach, we proceeded to make our way down the coast and quickly saw a sight that would be typical for the next few days: after driving along a sea road at a high elevation in the hills shrouded by massive trees, we get these glimpses of a beautiful coast. It is hard to express in pictures the beauty of this place. upcoming Solar Eclipse and compare with them thoughts about where to view it. Many agree that Madras is a good point and we meet many heading there. The Cape Meares light house. The smallest one we have seen! Since it sits high up on the cliff, a tall light house is not needed. Our first night on the coast was in Garibaldi OR at the Harborview Inn and RV Park. It would be one of our favorite places to stay the night on this trip. Day 3. Continuing down the coast. Sunrise of Day 3 at the Harborview Inn. Very beautiful but worrisome to see so many clouds. This is why we decided to move to the desert for the eclipse day. On the way out of Garibaldi we saw the Oregon Coast train steaming up for the day's ride. It was cool to see the old iron working. the natural settings and many red cedar trees, but it is still beautiful to experience. It falls 319' total, the tallest in the Coast Range. view. To begin, there is a dark rock monolith in the ocean, just like Cannon Beach. Then on the beach is this pink/yellow sand stone cliff (middle in the above image). It then transitions (out of view in the image above) to a yellow powdery dune that is as high as the cliffs. Three distinct massive formation that do not match each other. It is an amazing scene. of seaweed and mussels. It hints at the large beds in the water just off the beach. This is the transition area between the pink cliffs (left) and the dune (right). Stephanie and Agnes climbed the dune. There was also some kind of spring in the foreground. Water was visibly seeping out of the ground there and running to the ocean. We also stopped at Depoe Bay due to whale sighting reports. I thought "nah" we are not going to see any whales. Yup, we did! Thanks to the binocs that we had brought along, they were easily spotted. We learned to look for the blast of the spout and then the body and tail follow. The next amazing formation we visited was the Devil's Punch Bowl. To get a sense of the scale, there is a man (green shirt) in the bottom of the bowl. Hoping to pick up some Agates, we went to Agate Beach, but found only these curious natural sand sculptures. It was very windy, and that erodes away the loose sand. Our day ended in Newport, OR. Where we saw these noisy and entertaining sea lions bedding down for the night in harbor. had mussels. These were easily the best mussels I have ever had. They were plump and tasty. Probably the best meal of the trip. At Undersea Gardens (Newport) we saw this poor diver being attacked by a giant octopus!